This lightweight, non-greasy lotion with SPF 30 and PA+++ absorbs instantly into skin. This sunscreen is formulated with powerful ingredients that provide UVA (aging rays) and UVB (burning rays) protection from sun damage while helping to repair the skin barrier. Niacin helps to strengthen the skin barrier. Visibly improves skin tone, texture and hyperpigmentation. Ceramides help promote healthy, vibrant skin. Antioxidants protect skin against free radicals. Apply a dime sized amount in the morning on cleansed face and neck or over a moisturizer. Reapply as needed or after towel drying, swimming or perspiring. Active Ingredients: Avobenzone 3.00%, Homosalate 7.50%, Octisalate 5.00%, Octocrylene 2.60%. Iinactive Ingredients: Water (Aqua/Eau), Dipropylene Glycol, Myristyl Nicotinate, Polyester-8, Caprylyl Methicone, Cyclopentasiloxane, Panthenol, Glyceryl Stearate, Glycine Soja (Soybean) Seed Extract, Ceramide 2, Ceramide 3, Lycium Chinense Fruit Extract, Vaccinum Angustifolium (Blueberry) Fruit Extract, Arctostaphylos Uva Ursi Leaf Extract, Mangifera Indica (Mango) Seed Butter, Dipotassium Glycyrrhizate, Tocopheryl Acetate, Sorbitan Sesquioleate, Cetyl Alcohol, Methyl Glucose Sesquistearate, PEG-100 Stearate, Potassium Cetyl Phosphate, Hydrogenated Palm Glycerides, Butylene Glycol, Caprylyl Glycol, Sodium Acrylate/Sodium Acryloyidimethyl Taurate Copolymer, Isohexadecane, Polysorbate 80, Parfum (Fragrance), Polyacrylate-15, Polyacrylate -17, Acrylates/C10-30 Alkyl Acrylate Crosspolymer, Disodium EDTA, Phenoxyethanol, Chlorphenesin, Xanthan Gum, Potassium Hydroxide. This is really one of the best sunscreens I have used. A little bit spreads a long way. The cream is hydrating enough to even be used as a moisturizer for me. When sweating, this hasn't dripped into my eyes and nor does it sting as I've noticed some other chemical sunscreens do. I also like the way my skin feels while wearing this. I don't feel like I'm wearing a sunscreen. I have sensitive skin and I've experienced no reaction from this. I would totally repurchase. It doesn't leave an oily heavy feel to your skin, and almost acts as a primer as well as sun screen!!! LOVE this product! I have been using nia24 sun damage prevention sunscreen on and off for the past 4 years. I definitely notice a difference when I don't use it. it lightens any dark spots due to acne scars or sun damage and protects the skin in the process. if it can work great in Phoenix, Arizona then I think it can work anywhere. if is light weight and non greasy. in the summertime I use it as my moisturizer and in winter use after a lightweight moisturizer. lasts a long time (around 5-6 months) so definitely worth the price. ... apply it (at first it is greasy) leave for 3-5 minutes. Product absorbs-sets with a nice matt finish and feels great. Ready to go. Works well. Keep away from eyes. LOVE IT. So far I am very pleased with all of NIA24 products. I tried this sunscreen because the other products I am presently using seem to be excellent. My skin is amazing for a 65 year old woman. I have zero wrinkles to begin with, but I have always tried to use the best products. 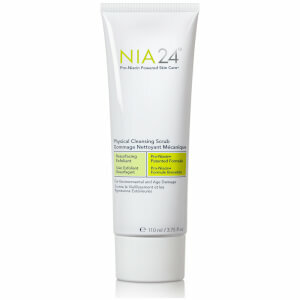 I am definitely giving all of the NIA24 products a good try by using them exclusively. My dark spots have lightened up quite a bit. My skin texture is excellent and I am hoping to keep it this way for a long time! Not only is this an excellent sun block, it also is a nice face cream that has a kind of smoothing effect before you put on your make up. It evens out the skin's tone and I look forward to wearing it instead of forgetting to put on my sun screen. This is really a nice line besides effective. I have already had surgery for basal cell carcinoma so have learned to take the sun protection seriously. I have used this product for about 3 years now and although I vacation in Hawaii and Arizona (on the lake!) very often I still get compliments from my dermatologist about how well I keep my face safe from the sun. To me that says my product choice is excellent. I do the best that I can and nia 24 helps me prove it!